This is the place to share your pictures (and brief story if you wish) of your 2017 Big Game harvests. . Whether they're taken with bow, rifle, shotgun, smoke pole, hand cannon, spear, or the Five Point Exploding Heart Technique, let's see your 2017 harvests! The previous year meat poles are all located in the Archived Tips section if you wish to view them. wawhitey wrote: IM NUMBER 1! Wow... pics of you skinning, cooking, and eating that sucker, or it didn't happen! shot this 7x7 on July 29th at 40 yards with my bow. pretty epic hunt to say the least. thanks for looking and good luck to everyone this year! thanks for the invite, RJ. There's that beautiful Tule Bull! Thanks for sharing it with us Idaho. Beautiful. Nice one. Were they bugling there already? Brown down! Brown down! Stringunner took down a dandy 5pt yesterday afternoon and i wacked a cow this morning. Maybe i can get him to post pics. Im still in da woods. Awesome Oly, congrats to both you and Stringunner! Alright, guys! Pictures or it didn't happen I've got nothing to show for my two rookie mistakes. 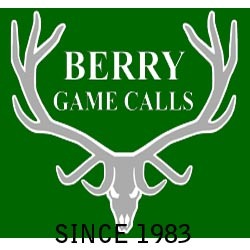 Heard 3 out of 4 at Swedes OR elk camp have scored. Two Bulls, one cow. I imagine they may still be packing or recooperating . Nice job Idaho, well done! Actually 3 of 5 at Swedes camp. Swede and my dad are still trying to fill their tags. I'm onto my buck tag now. Oly and his buddy left today. Dad, Swede and I are still up here through this coming weekend. Hopeful we can knock out these last two elk tags! Big props to Oly and his buddy Tim, the five of us packed out my bull Saturday night long past midnight, as I shot him in a terrible hole, I drove the meat home and was gone Sunday taking care of it. Sunday morning after only 3 hours of sleep (helping to pack my bull) Oly shot his cow at first light, he and his buddy packed it out. 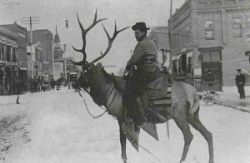 His buddy then shot a bull that afternoon at 4 which they then packed out. Those two guys packed 3 elk in 24 hours. Those two guys are packing beasts and hecka great guys to know and hunt with. I can't post pics as I need to resize them, but will post them up when I get home after this week. stringunner wrote: Actually 3 of 5 at Swedes camp. Swede and my dad are still trying to fill their tags. I'm onto my buck tag now. Oly and his buddy left today. Dad, Swede and I are still up here through this coming weekend. Hopeful we can knock out these last two elk tags! Well here is some of the damage! Epic hunt really. Big thanks to Swede, Stringunner, his dad and my buddy Tim. They were all a huge help and it made the hunt one of the best ever! 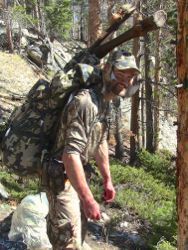 Stringunner, I sincerely appreciate all your help with the scouting and especially staying longer to help my pops. You and your dad are top notch in my book! Let's get together after season to rehash and tell some tales! I don't have a better pic of Tims bull but it was already being cut up by the time I got to him. I will get a better one from him. Nice work, guys! 3/5 is pretty sweet. AND it's only been one weekend. What's next for you olympus? cohunter wrote: Nice work, guys! 3/5 is pretty sweet. AND it's only been one weekend. What's next for you olympus? I haven't had a chance to look over the other parts of the forum but I am wanting to hear about the "rookie mistakes" part. I do a lot of those so it's nice to hear others are human too! I'm not sure what is next. For the near future, helping take care of the kids. We have an almost two year old that is a hand full. Fun, but wow....that boy is a menace. In two years it shouldn't be as bad getting away for more than a few days. I always shrugged it off when my mom kept saying she hoped we had a boy so I knew what she had to deal with but I get it now! My two girls where not nearly as much craziness! I have a deer tag so I hope to get some time for that locally. That and I will continue to encourage Swede. He sure has had the ball bounce the wrong way the past few years with a few more BAD bounces mixed in. It takes a toll....all the wrong bounces. But one thing that is certain. a large percentage of the elk that are killed by me and my campmates can be directly attributed to him. I always feel the elk I kill are just as much because of him. Just because he didn't get one is irrelevant to me. He puts me in the best spots, scouts for me and has given me a ton of help with gear. My elk are just as much dead because of his dedication. 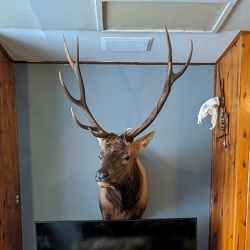 Two elk were killed last year by his cousin and his partner that wouldn't have been if not for Swede putting them on to those elk. He went without. He would kill more and likely every time if he was a bit more selfish but that just isn't him. But that is elk hunting too. Being in the right spot at the right time is part luck. Congrats to all of you so far...I'm headed out next weekend with my bow. Just dropped my cow off at the processor this morning, and can chime in on the meatpole this year! This was my first archery elk (first bow kill ever actually). I wanted to thank the forum for all of the help and advice. Using all of shared knowledge on this site combined with the last 4 seasons of trial and error, I was finally able to put it all together. Sorry I don't have a pic. I was alone, and it was HOT so I was in a bit of a panic to get the field dressing done. In my rush to get the meat off the mountain I didn't even think about taking any pictures. My trophy pic will have to be boxes of steaks, sausage, and hamburger. I still have a deer tag, so maybe I can really pack the freezer this year. Thats awesome Nick, a huge congrats! Congrats Nick. Hope to tag up with you later this year. Sounds like maybe you got one of those cows last year I just couldn't get to come out of cover. Congrats to everyone successful so far. Had an interesting weekend in the woods myself. Mixed emotions.... I ended up shooting a cow. Said I wasnt going to pass on any this year after a two year dry spell. Stuck to it and arrowed one at 32 yards. Picture of the day pack loaded up. Mixed emotions because I wont be chasing bugles anymore this year. Planning on heading out to help a friend, so ill be able to get my fix that way. Congrats Brent! Nice job. Any elk is a good elk! Congrats to all so far! Here is my Labor Day Bull. Muzzleloader at 40 yds. Mandrroofing, I cant see the image you tried to attach. Rangerz great looking Bull there and I think first up for ML congrats. Great bulls guys! Matt I saw the first few tines of your bull on another forum, you can tell he's a good one just from that. wow! this thread is much more action packed than last time I looked!!! well done gents, lots of great memories made, and excellent meat put up! Idaho, is that a tule? regardless, that bull is cool as heck! olympushunt wrote: Well here is some of the damage! Epic hunt really. Big thanks to Swede, Stringunner, his dad and my buddy Tim. They were all a huge help and it made the hunt one of the best ever! We called him to 25 yards. After I tried to shoot him with the safety on, I was able to get the job done on my 2nd attempt. Paul ll puts this ID bull down, OTC public land! Its what I expect from the ElkNut crew! Nice work Pauls!!!! That is a perfect specimen if there was one. And Roosie....holy smokes guy! THAT is a giant coastal bull! Thats a fantastic buck there, did you get a gross score by chance? 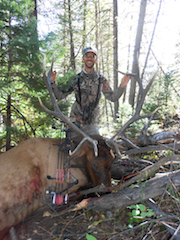 Congrats to all the successful elk hunters! Will, beautiful bull bud! Nice work! Thanks Clipshot for getting us both in the photo! ElkNut1 wrote: Will, beautiful bull bud! Nice work! 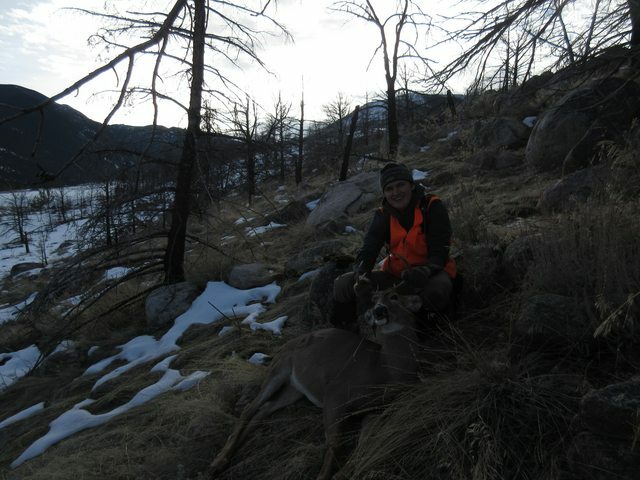 I got to help a couple buddies on Valles Caldera hunt in NM. I think pics are attached. Looks like the images are too big, max 800*800. You need to reduce the overall resolution and repost. Well, I am back and very tired. I had a great hunt with a cornucopia full of new experiences. Those experiences are the foundation of a hunting education. My hunts were all with dedicated caring men. For some the hunting season was over nearly as soon as it started. For others it has been a long grind. My hat is off to all. I finally nailed down a spike. The picture will come tomorrow or sometime soon. Congratulations also to all of you other hunters from different camps that harvested fair chase game. 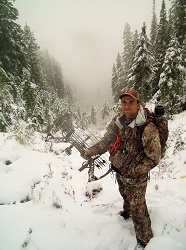 I felt my season was a success well before I shot the elk. I hope everyone that put in a complete effort, for the time they hunted, felt a full measure of satisfaction even if there is a sting from not punching a tag. I too know all the emotions that come from hunting, but learning and just experiencing God's wonderful creation has to leave us humbled and exhilarated at the same time. There is gratification and hope enough available for all true hunters even if we have to buy a steak or drum stick at the supermarket. Rosiebull, I know how you must have felt packing out the antlers. 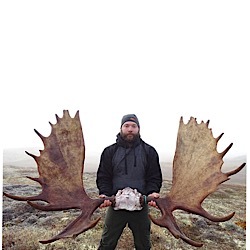 Swede, very well said, nice addition to the meat pole, and congrats on the bull!!! A huge congrats to all who have connected thus far. Horse of a moose Ed!! 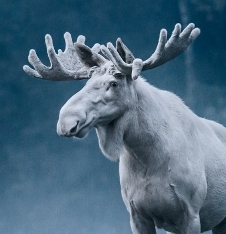 Incredible moose!! Flat out awesome! Way to go swede & Ed, that's getting it done, congrats guys! Awesome pics everyone!! Hopefully I will be adding some from my son's hunt here in about 5-6 weeks. Montana and Idaho OTC Public. Elknut rules!! Tigger, jensenrw... way to get er' done guys! WapitiTalk1 wrote: Tigger, jensenrw... way to get er' done guys! agreed! nice bulls guys! would love to hear the "how it went down"
An epic end to the weirdest, longest, and most emotionally up-and-down 9 days of elk hunting I've had in so far in ten years. 6 x 7 Rosie (Cascade Rosie) bull down on September 17th. The "Cliffnotes" run-down . . . To start the season off, I discovered my treestand rig and 2 trail cams were stolen (two years in a row). Posted about it on Facebook and another forum. Mysteriously, the kids brought the stuff back 9:30pm the night before the opener, in an awkward and uncomfortable encounter with me and my brother. They weren't expecting us to be camped there. Then, on opening day we discovered someone dumped part of our water cache, and left the water jug (Same people? I'm thinking probably). Crickets for the first 3 days. After rigging the receiver chain with a quick link, to patch it back together, I set my treestand all back up later on the third day; praying that none of the other links were weakened, which would snap unexpectedly and send me crashing to the hard ground 23 feet below. Of course the Lifeline would arrest me, but this isn't how my brain thinks in anxiety mode. I was fuming all over again afterwards. My brother had to leave that evening and so he missed out on all the action. Comfortable, back up in my perch, I got a bull and his cow talking the next day. I chased them around for 4 days, both from the ground and from my treestand. This guy's hormones were RAGING. I've never heard vocalizations like this. The ramped up variations in his chuckles and bugles were nuts. He was so throaty, I thought it was fake. Thought it was a hunter who was bugling and blowing a lot of air through his tube. Until he came out of the timber, that is. He walked by my stand at 50 or 60 yards, with a ton of brush and trees between us, so no chance for a shot. So I just sat and watched on high alert. Four days of frustrating, but outstanding elk behavior observation. A lot of back and forth calling action with them, I could write a whole post just on that several days of calling craziness. A huge, special thanks to Swordtine (on the other forum) and his brother for taking time out of their hunt to help me cut and pack out this magnificent beast. I met these guys about 6 years ago, and they represent everything a fellow hunter should be. Momma brought you boys up right! With all the low back problems I've had the last few years, it would've taken me an extra full day to bone out and get all the meat out by myself. Last minute of my last day . . . you just never know when it's gonna happen. The only time I've hugged a tree is to hang a stand. what an awesome bull!!!! love it! Roosiebull wrote: what an awesome bull!!!! love it! Thank you very much Roosie! Still in disbelief how it all played out. It's a little clunky, immediately switching gears from accepting defeat and getting ready to haul your camp and gear out, to having to bloodtrail, quarter, and pack a bull out lol. Outstanding story and bull yourself! Stud of a bull Shawn and great write up! You were due buddy and came through in epic fashion! Thanks RJ! Sounds like you guys had a fun camp this year. Looking to see your addition here, come late season! Holy crap guys, nice meatpole this year! 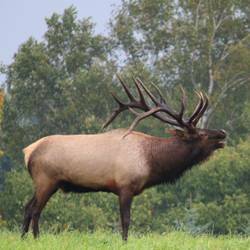 Washington Wapiti what a great story, and a nice bull to go with it! Backyard wrote: Holy crap guys, nice meatpole this year! I agree David... bumper year! And... its not over yet. Smoke pole season is on-going in many locales, boom stick season is getting ready to kick off, and there are the late seasons in many states to boot. Bring em on fellas! Thanks Backyard! A lot of great animals for sure, and a year full of twists and turns for quite a few folks. Can't wait to see what happens with the remaining seasons. hope it's not my last meatpole entry of 2017 (plan on filling my second lion tag) but realistically, this might be the last for the year. Dandy BT buck Mike! Do you have enough room in the freezer for all your game this year? WapitiTalk1 wrote: Dandy BT buck Mike! Do you have enough room in the freezer for all your game this year? thanks! i'm very happy with him. I have a fall bear tag as well, but I don't need to kill a bear...wait for spring bear to do that. we do like bear meat, but I only kill bears when the freezer is "light"
they are more fun to hunt than kill anyways, I always talk myself out of killing them. 2017 Utah Elk Hunt all I can say is I put it all on the table, I shot this bull on last day of the elk season. I pasted some petty good bulls trying to shoot a big one in the Wasatch Mountains. Its all good I had some great memories. Good Luck to you guys that are still hunting. 2017 Idaho Elk Hunt I called this bull in over 400 yds in the rain and wind. I used a 90 foot cliff to help with shifting winds. I shot this 6x6 Bull at 42 yds. Good Luck to you guys that are still hunting. Nicely done Glen; two state bulls! Great buck, Roosie! Get after that lion! Way to go Glen! Sounds like a great season and plenty of action, and lots of good protein! Nice bulls! Huge black tail down!! 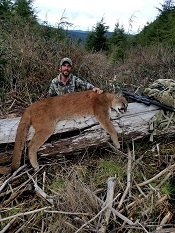 First rifle kill in more than 30 years. A guy has to put something in the freezer, yes? On to the late WA archery season.. hopefully, the elk gods will shine brightly on me and I can put some meat "quantity" in the meat freezer. On a more positive note, I think Mrs. Wapiti is finally interested in hunting..... looking at a Browning .243 for her. May not happen this year but with a bit of practice with her new boom stick, perhaps she can assist a bit with next year's wild game gathering . Anyone could have killed Glen's bull. It is obvious it was asleep. Anyway it is an excellent animal and one to be proud of. Congratulations Glen and congrats to all of you that have brought some game home. 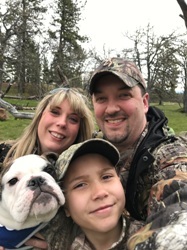 My daughter and I went antelope hunting....story in "Other Big Game" forum. Nice job guys. Scubo, looks like a solid shot location mister. 216 yards offhand. I was kinda proud of that one. 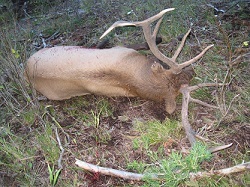 At 74 years old and no desire to ever chase PP's again, this was my last time to hunt Elk in Colorado. My first Elk hunt was in 1973, so this closes a 44 year long "season". I took this bull at ~175 yards shooting a 30-06 with a 165 gr Nosler Accubond. My Son accompanied me, and hopefully I will be able to accompany him next year. A proud old fart with his last Elk. 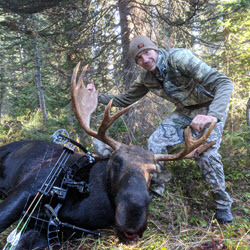 Awesome bull Lynn, a huge congrats. Magic, very well done, and thanks for sharing your story! pretty meaningful bull. Texas buck! Now on to Montana. 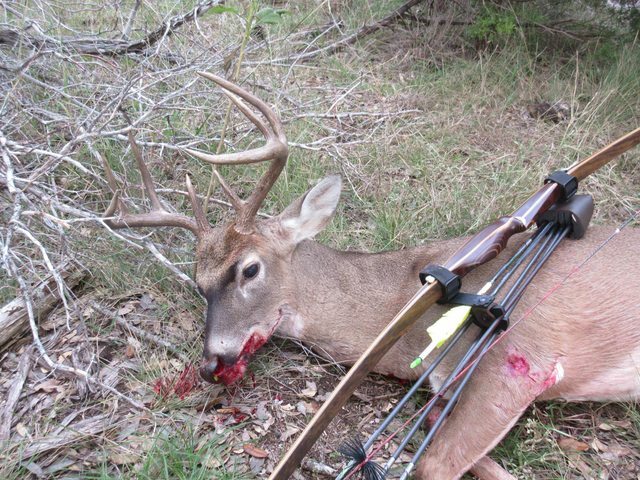 Malachi, awesomeme Texas whitetail, and, with a stickbow to boot! Good luck back in the home state. My incredible fall continues! My biggest buck to date. For those who like scores, he scored 149 (147 as a 4X4). His G2 was over 12". 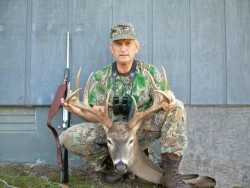 Dandy WT buck Tigger and what a season you're having! 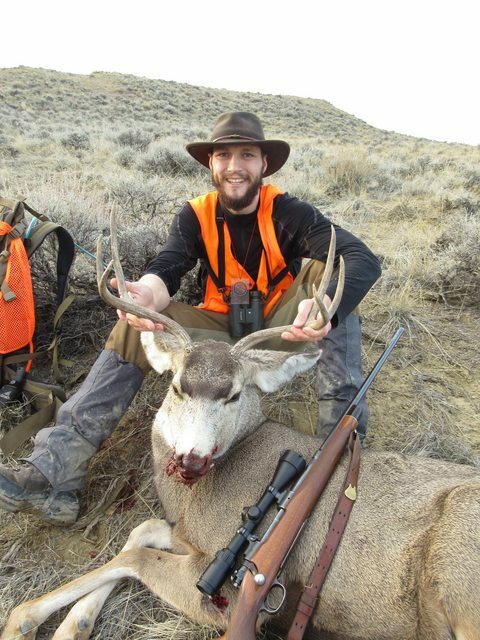 Nice bull, antelope X2 with your hunting partner, and now a beaty of a buck. Of course you know, any more Tigger additions to the 2017 meat pole may result in a small fee for taking up so much space, lol . Well I am all out of big game hunts this year. I will be shooting some roosters though, so I could put a picture of them up I suppose. Hardly the same eye-catching, awe-inspiring viewing as a big ol' bull, but they would add a little color to the place. They certainly out-color big game. I should be charging you rent to host those pictures! Man, I'm glad you didn't pull a moose tag this year Tigger. I may have had to increase the site bandwidth Yes sir, throw some of them ring necks up when you get em (no charge)! Well i have venison. I just mercy killed a young buck with my general tag. Somebody had shot his right knee. He was in bad shape, and wasnt going to survive that. So i put him down. Not the kind of buck i would have wanted to kill, but i still have my raffle tag, so i can still go out and look for a wall hanger. This pic here is where some knucklehead shot him in the knee. His lower leg was just flopping around like a limp noodle. Can I count this on the meat pole? He did stink, that’s why he’s still laying there. My bride was upset that I didn’t have him mounted. We already have a couple coyote hides laying around the house. Got to love her. I shoot it and she decorates with it. Im gonna need a 30gal drum of teriyaki sauce to submerge this thing in for about a week. This isn't my best effort at a good rooster picture, but it will do for now. Shot 3 this morning, 2 on my land and 1 on some public. 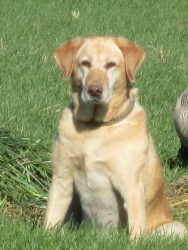 Good dog work by my young lab. I think it was 11 degrees with a 20 mph wind which made for some cold cheeks. This was the bird I shot on the public land. These are all wild birds. My hunting partner with his 2017 Nevada Desert Bighorn. My partner and I after we lowered his sheep down the mountain on a rope. This was photo was taken my putting my ClipShot on a hiking pole stuck in the creek bed. I helped my brother get a buck as well. So i had a good day today. YES! A huge congrats Dean on a DANDY WT Buck! Damn proud of you mister...... Don't you have some butchering to do? Couple more pics. Edit to add a little info. Buck taped out at 159 6/8. After pulling the jawbone, my taxi aged it at 9.5-11.5 years, most likely 10.5. He has 45 years of experience, and i trust his judgement. I actually guessed 10.5, minimum of 8.5, but i didnt tell him what my guess was. A few years back my dad killed a buck that we had watched his antlers shrink for 2 or 3 years, and when i walked up on this guy what struck me was how big and barrel chested, beer bellied he was. His body was just massive. Immediately made me think of the old boy my dad got. The body, combined with the heavy mass and weird things going on with the rack led me to guess 10.5, and it looks like i made a good guess. Ill be sending a tooth in for aging just for fun. Wdfw supplied me with an envelope for tooth aging along with my permit, came in a package in the mail. No cost for me to send the tooth in. Fantastic buck! Man, that is a great feeling, isn't it? Soak it all in and keep fondling that rack! Tape measure showed he was 300-315 lbs.60" snout to tail and 50" heart girth with 2.5" cutters. 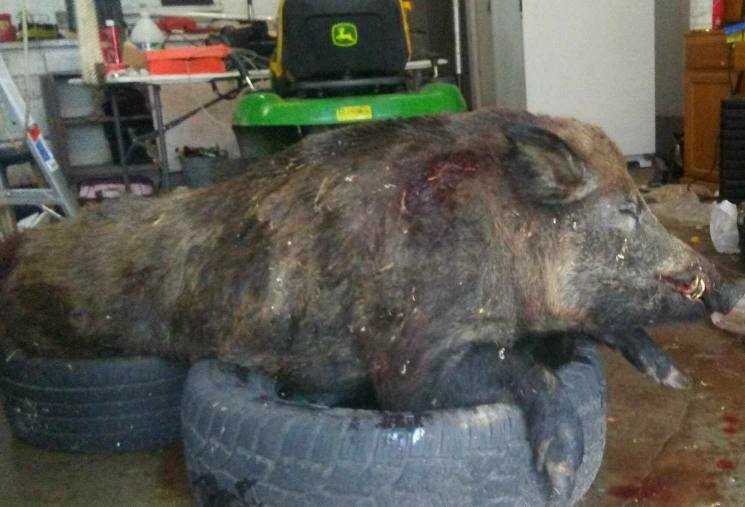 Pretty big hog for Missouri public land. My 16 year old daughters bull from October. She was lucky enough to draw a unit 34 youth ES tag in New Mexico. The bulls were super quiet for it being early October. We saw a cow up at the head of a long canyon so we dropped off the trail into the bottom to cut the distance. As we were working up we saw 2 elk up a side canyon, a 4x4 with a cow. We decide to use the cover of the end of the hill to cut the distance so she could get a shot. As we were working toward the bull I look back at the original cow to make sure she's not looking at us and I spot a 4x5 eating between us and her. As I tell my daughter he picks up his head and looks in our direction. I tell my daughter who decides to take him. She rips off her backpack, drops to prone, and gets ready to shoot. I am watching through my binocs as she shoots and the bull drops where he was standing. I tell her she hit him and that he is down. She cycles another round into her 7-08 and asks "is he getting up?" I tell her he's down to which she replies "but dad, is he getting up!!!" I say again "no, he's down!" She asks again "BUT DAD IS HE GETTING UP, YOU TOLD ME TO ALWAYS GET READY TO SHOOT AGAIN!!!" I tell her again, "he's down and not getting up." We make our way up to the bull, he's down for the count. She made a perfect shot at 187 yards with her 7mm-08 (using 140 grain nosler accubonds). She was super excited with her bull, helped quarter and haul out (about 1.5 mile pack out). What a great experience to take her hunting again!!! My happy huntress!!! The original cow was up at the head of this canyon. 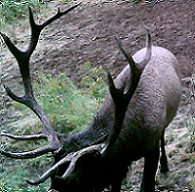 The bull still had strips of dry velvet on its' antlers, did a euro mount and left the velvet. Way too cool Ixso! Congrats to the young lady! How awesome is that! 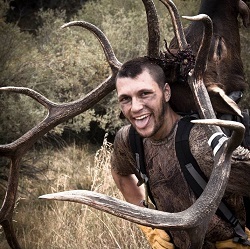 The smile sais it all; congrats to the young elk slayer.